Italy is a country filled with unique historical, architectural and cultural treasures. It’s also one of the most popular vacation destinations for visitors from around the globe. Understandably, most tourists—especially first-timers—opt for some of the larger cities, which are world-class, certainly not-to-be-missed destinations, like Florence, Rome, Venice, and Milan. A close second in terms of crowding: Visitors know that beauty is abundant in remarkable places like the Cinque Terre, the Italian Lakes and the Amalfi Coast. As a consequence, many of these destinations, cities and towns, both large and small, are exceedingly popular, too, and become over-touristed, losing some of their authenticity and character. Not too long ago, I wrote an article for Forbes entitled, 3 Unforgettable Under-The-Radar Towns in Italy that simply wow-ed us. We had no plans to visit any of these small Italian villages and simply “discovered” them on the way to someplace else. Yet, these little places created indelible memories. When my Facebook friend, Laura Bizzari (who teaches both English and Italian to foreigners who come to live in Bologna) saw the post, she kindly asked some of her students to write about some of their favorite discoveries. Their “insider” writings about these seven small Italian villages are just a sampling of all the hidden treasures waiting to be discovered if you veer a little bit off-the-beaten-path. Our suggestion: Travel slowly, find a place to stay for a couple of weeks or more in a medium-size city, and explore the area around you by car, public transportation, by bike or on foot. Thank you to these wonderful students for daring to learn and write in a second language, and sharing their impressions with such eloquence. Monteveglio is a little hamlet within a small village that’s about 25 kilometers from Bologna along the Bazzanese Road. When you reach Monteveglio village, which doesn’t have much to recommend, go past it towards the hamlet. It is located in a hilly area where an abbey, of the same name, towers over it. The remains of defensive walls, the magnificent Romanesque-style abbey, some nice small villas and restaurants, and the amazing view make the hamlet worth visiting. As for food specialties, you can taste crescentine (fried thin pasta) with cold cuts and dairy products and many other traditional dishes combined with a delicious sparkling wine typical of the area. As an aside, I like this hamlet because I discovered it with some friends and their children when my daughter was a child. We had embarked on a day trip to Monteveglio Abbey and were invited as guests in a friends’ country house of our friends. Our friends decided to walk through a large path of clayish soil (calanchi) instead of doing the main street and the walk was really fantastic although a little bit hard. Dozza is a small, enchanting medieval town (with about 6580 inhabitants) not far from Bologna in the region of Emilia Romagna. It’s very characteristic because the narrow streets are made cheerful by the brightly painted walls of the houses. In fact, during the Biennale del Muro Dipinto, many famous painters come here from other Italian cities and foreign countries to paint different subjects in the walls: men, women and different symbolic scenes. Also, the medieval Sforza castle in the town was built with defensive walls (when Caterina Sforza had a feud) between1494 and 1499. It’s well-preserved and you can walk to the top where you have a splendid view of the landscape from the merlons of the castle. In the lower level, you can visit the prison with different instruments of torture. But you can easily forget these sad things with a good glass of wine because, near the prison, there is a wine cellar where you can taste and buy many local wines. Finally, you’ll also have the opportunity to appreciate in nice small restaurants the typical dishes of the local cuisine: tortelli of ricotta, tagliatelle, garganelli (a kind of macaroni al pettine), pecorino di fossa (cheese) and piadina (a sort of bread that can be stuffed). Buon appetito! La Scola di Vimignano is a very little village in the Apennines hills near Bologna, in the upper Reno valley. It was built in the XIII century as a defensive wall for the Byzantine kingdom against the Longobards (Lombards). The existing buildings were all built in the in XV-XVI centuries. The village is so well-kept that it seems as if time has stopped! Walking through its narrow streets, where cars cannot enter, you can see a lot of beautiful sights and take wonderful photos. 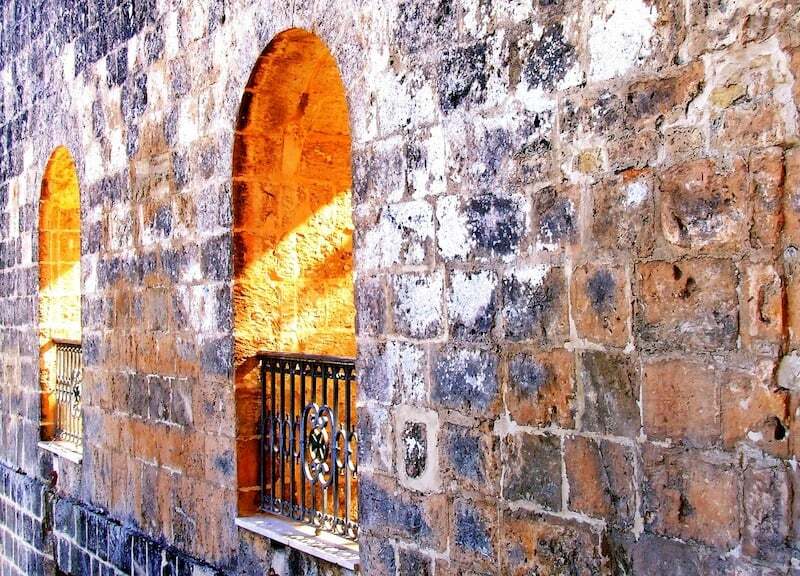 You can pass through an archway, the doorway of the ancient village, to see houses and tower houses linked by a wooden balcony as well as defensive towers in private residences. Casa Parisi and its beautiful sundial have been recently restored. La Scola has three little churches: S. Peter’s oratorio, S. Francis oratorio (now embedded in a private house) and S. Rocco’s oratorio with pictures of saints, and a huge cypress tree that’s rumored to be about 700 years old. The environment is relaxing, full of peace, silence and quiet, a surreal atmosphere where you can imagine life in the past. Certainly you won’t find crowds of tourists but you also won’t find restaurants or coffee shops. So if you want to eat or drink something, get lost in nature and have a picnic as one might do in the Middle Ages. Solomeo is small village located near Perugia, in the region of Umbria. It lies atop a hill beside the ancient route leading from Perugia to Lake Trasimeno. My personal interest in this village emanates from my family origins: My father, Marino, was born there at the beginning of the last century. The village has had relevance for very few people over time except, perhaps, for the founders of the Villa Solomei at the end of the XII century or for the few hundred inhabitants of the small castle named Castrum Solomei during the XV century (who have left us the legacy of some Renaissance buildings) along with XVIII century inhabitants. The village was more or less in continuous decline. After the Second World War, that decline was almost total. So, why I’m writing about it? For the simple reason that not only was my father born there but also the father of a businessman known worldwide in fashion, Brunello Cucinelli. In the 80s, the son wanted to honor the origins of his family and proceeded with a total restoration of the village. In a few years, he brought back the magnificence of the ancient stone buildings and St Bart’s church among them. At the same time, he brought back people, life, activities and richness into the village. If you enter into some of these restored Renaissance buildings, you can actually see expert artisans at work, mainly producing rare cashmere clothes. You can see a number of young people, too, learning from the experts, aiming to continue the tradition of that precious handicraft. In addition, some new stone monuments have been created close to the village, keeping in perfect harmony with its original character. Because of this harmony, Solomeo has earned the name of “spirit village.” Among the new monuments, one that stands out is an open-air theatre hosting many cultural events each summer. More recently on the plane at the foot of the hill, three wide parks have been built. The first one dedicated to sustainable industry, the second to wild nature and the third to agriculture. All together, they form a so-called “beauty project”. As a matter of fact, you can enjoy their perfect forms from the top of the hill. As the historical buildings, studios and three parks are almost totally open to the visitors, you can not only admire the sites but also appreciate the handcrafted clothes and other products, and locally-produced wines. For a total immersion in such a nice atmosphere, plan to spend at least a night in one or another among the restored buildings in the ancient village in the middle of a magnificent vineyard. Riola di Vergato is a small town in the province of Bologna. Finnish architect Alvar Aalto, the great master of the Modernist Movement (who was appointed by Cardinal Giacomo Lercaro in 1965) designed its parish church. It’s a little-known monument and the only project that the architect realized in Italy. The church was completed in 1978. In harmony with the landscape, the church’s exterior profile was inspired by the three surrounding mountains: Montovolo, Monte Vigese and Monte Vigo. The interior of the church is moderately unadorned. The natural light is diffused from above through vertical, asymmetrical ribs, which create a soft light onto the believers. There is the only other window near the hexagonal baptistery that looks towards the Limentra torrent (two mountain streams). The Sacro Monte di Varallo (Sacred Mount of Varallo) is located in Valsesia, in the province of Vercelli, Piedmont, near Lakes Orta and Maggiore. It is the oldest and the most important Sacred Mount of the alpine region. Its story begins at the end of the 15th century when the Franciscan friar Bernardino Caimi from Milan, on his return from the Holy Land (where he had been the guardian of the Holy Sepulchre) decided to reproduce the holy places of Palestine in Valsesia. The “New Jerusalem” as the Sacred Mount was initially called, was meant to reproduce the distant sites of the Christian tradition for all those who would never be able to go there. There is one more peculiarity that makes this incredible place unique: It has no doors, no ticket office, and no opening or closing hours. You can visit at any time of the day or night. The Sacred Mounts of Piemonte and Lombardia have all received an important UNESCO recognition designating these extraordinary devotional complexes on its World Heritage List. Castelvetro (Modena, Emilia Romagna) was originally an Etruscan settlement until the Roman legions created a castrum (military camp). Hence the toponym (name derived from a topographical feature) “Castelvetro,” which derives from the Latin castrum vetus (old / ancient encampment). The village is entirely crossed by the river Guerro. It offers a great number of opportunities for those who want to know the history and culture of the area, rediscovering important testimonies from the past. On the square are the Town Hall, the Clock Tower (square) and the Prison Tower (about 22 meters high). Considered the true heart of the town, all the buildings located in the northern part of the castle were demolished, with the exception of the Towers, to create an open space overlooking the valley below. In place of the previous one, in the center of the square, paving of white and black slabs was made to form a chessboard. In addition to the Piazza, the Parish Church (1897) and the Castle of Levizzano Rangone with its Matilda Tower and its dominant position on the hills are worth a visit. In the picturesque landscape that surrounds it, some paths branch off, winding along the torrents and the immersed ridges in a scene full of ancient buildings and historic buildings, with views of particular beauty between hills interrupted by the majestic calanchi. Nearby are parks and reserves, towards Levizzano the Grasparossa vineyards, the Via dei Ciliegi between Vignola and Marano or the Pilgrims Route in Campiglio. Castelvetro boasts a series of incomparable typical products in addition to the Lambrusco Grasparossa DOP, the balsamic vinegar IGP (do not miss the visit to the Acetaia Comunale), the Nocino, and the Prosciutto Modena DOP. These towns are so charming! I love exploring off-the-beaten-path places! Love small towns. We did the opposite: stayed in one and toured big cities around it in 2015. But in Mexico now, we are staying in Mazatlan and exploring the little Mexican towns around. Another good way to travel! Talk about insider tips! What a great idea – have locals tell us THEIR hidden Italian gems. I already warned my husband that we are going to Italy this year, and Bologna and Modena were both on the list. This post will be saved. Love that you encourage ‘slow travel’. There are so many wonderful small towns in Emilia-Romagna. We have an almost identical photo of the Monteveglio Abbey. Modena and the countryside surrounding it are full of surprises and incredible food. You have just placed the other samll towns you mention on our Italy bucket list. Love the article. Get ready for some more from these wonderful students! I’d love to visit Italy in general, since I’ve yet to make it there! Dozza looks lovely with the murals on houses, the medieval castle, and I also would enjoy tasting the local wines. Small villages are fun to explore, no matter the destination! Love this article! I was tickled to realize I’ve actually been to one of them! It would be a kick to return to Castelvetro di Modena–and visit the others as well–for a closer look, armed with these insider tips. I’m headed back to Emilia Romagna and can’t wait! Pinned. Of course it would be easy to add 7 or 14 or 21 more! (Martina Franca in Puglia?) These are great suggestions. Yes, I’ve been to Martina Franca. A wonderful place, too! Thanks for this. We’re always on the lookout for places ‘off the beaten track’ in Italy. The better known towns are being flooded by tourists for most of the year now (hey, we’re part of the flood as well), but there are plenty of unvisited places – you just have to look for them. Yes, it is infinitely nicer to travel slowly—and without crowds! These small Italian villages all sound delightful to visit. I would have trouble deciding on which one to visit first but think it would be Dozza. Love that mural and that the town is so very small. I’m a sucker for street art, too! You will have such a great time! Be sure to read one of my many posts about Bologna! I’m always amazed at how much there is to see in even the smallest Italian town or village. I’ve never been to any of the places on this list (despite numerous visits to Italy), so thanks for showing me some new places. It’s always nice to see another slice of Italian life! Thanks for this. Have added them to the list and shared. Always good to find new off-the-beaten-track places away for the hordes. Glad you found some “new pearls” on the list!